Double bonds are one of the key functional groups in organicsyntheses. 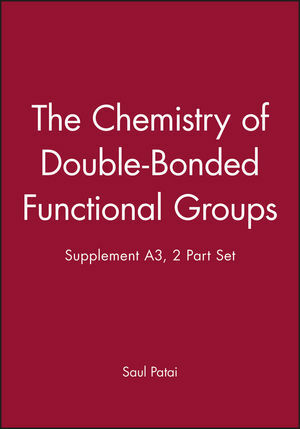 This supplementary volume deals with advances inphysical organic chemistry, especially in MS, thermochemistry andphotochemistry. Applications include the use of double bonds inliquid crystals. Professor Saul Patai, The Hebrew University, Jerusalem, founded the Patai Series. Heteropolar Double Bonds (T. Hoz & H. Basch). Mass Spectra of Double-Bonded Groups (T. Gaumann). Dipole Moments of Compounds Containing Double Bonds (O.Exner). Liquid Crystals with X=Y Groups (T. Hanemann & W. Haase). Thermochemistry of Olefins, Carbonyl Compounds and Imines (S.Slayden & J. Liebman). Photochemistry of Compounds Containing C=C Double Bonds (N.Haddad). Nucleophilic Attack on Compounds Containing C=C, C=O or C=N Groups(P. Taylor). The Thiocarbonyl Group (M. Molina, et al. ).